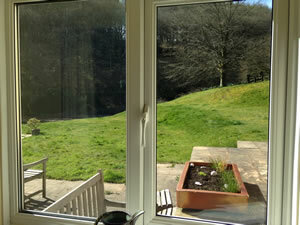 Bellbrook Valley in South West England is a perfect choice for a great holiday or a fun short break in Devon. Find out more about Bellbrook Valley below. 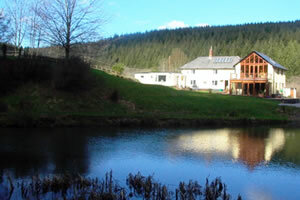 Our holiday cottage offers you a private hot tub and garden within the stunning setting of our farm and trout fishery. It is the perfect base for walking, cycling and exploring this beautiful part of Devon. Pets and families are welcome. 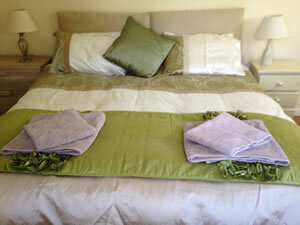 The cottage sleeps 4 and it has had great reviews; a warm welcome and home produce awaits! With a large private garden and wood fired hot tub your stay at Bellbrook Fishery is guaranteed to be a relaxing one. Bellbrook Cottage, part of which is made from cob and dates back to the 16th century, has been newly decorated and furnished in a warm country style and is all on one level. There are two generous bedrooms that can either be made up as twins or super kings, a bathroom with large shower and an open plan living area with a well equipped kitchen. There is Sky TV, internet access, two comfortable sofas and a selection of games and books for those wet weather days! The cottage forms an annex attached to the owner's farm house and is set down a quiet country lane. It is one of two holiday properties and forms part of a working Trout Fishery and small holding covering 40 acres and boasting seven lakes. The large, private garden is very secure for pets and children and, as well as having a lawned area, boasts several areas dedicated to the natural flora such as bluebells, Hellebore and Primroses. The hot tub is situated on the patio area, seats 6 and can be heated ready for you to use on your arrival. Robes are also provided for your comfort. The hot tub is wood fired with an air bubble system and is very quiet; the soothing crackle of the wood in the stove and the natural scent will only make the atmosphere around, and in, your wooden hot tub even more special. We aim to make your stay as enjoyable as possible and to this end we have provided little luxuries such as Duck Island toiletries and homemade produce, as well as everyday essentials from salt and pepper to cling film. Complementary tea, coffee and sugar are provided and you are welcomed with our own free range eggs and a homemade loaf! Dogs and children are most welcome and a travel cot and high chair are available free of charge. We also aim to be as eco-friendly as possible and most of the electricity and heating are provided by solar panels and a biomass boiler. In keeping with these intentions the hot tub is wood fired and therefore only takes 2-3 hours to heat in comparison to electric ones which take 4-6 hours. Here on the farm we breed our own rare breed sheep and at the right time of year our fields are full of lambs. We also have a pair of pet pygmy goats who love a cuddle! There are many beautiful walks right on our doorstep and of course there are the grounds of the fishery to explore. Bellbrook is also an ideal base for walking, riding, cycling or trying your hand at fly fishing - we have a lake suitable for beginners and children and rod hire is available. We are easily accessed from the A361 - the M5 is only 15 minutes away. The local villages of Oakford and Bampton have welcoming pubs with local ales and good food. The nearest pub is 1.5 miles away. There are also two excellent restaurants nearby. Local shops and supermarkets can be found in Tiverton which is 10 minutes drive - there is also a regular pannier market with tempting local produce. We are close to the historic market town of Dulverton which is known as the gateway to Exmoor National Park and is a must for the cream teas! Please email (info@bellbrookfishery.co.uk) or phone (01398 351 292 / 07967 335 159) to book, or to ask any questions you may have. Please be advised that there is a charge for pets and we require a refundable deposit when booking a stay with pets. We look forward to welcoming you to Bellbrook Fishery! 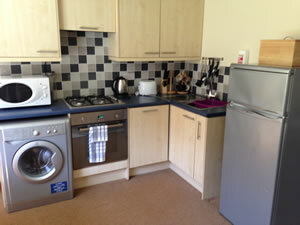 Bellbrook Valley is family friendly self catering. We have the following details listed regarding Bellbrook Valley accommodation accessibility but we would recommend that you always confirm these prior to booking with the owner or operator. Bellbrook Valley is a great base to explore the wonders of Devon and you will find plenty of activities near by. Bellbrook Valley is at Tiverton, Devon EX16 9EX. Check out the map below for directions, use the controls to zoom in. If you have stayed at Bellbrook Valley why not add your thoughts, comments, pictures to our Facebook page? Don't forget to add the name/town/page link to your comment so its attributed to the correct place. Please keep it polite, we are sensitive souls! Find Cottage Holidays works closely with independent cottage owners and leading holiday travel operators to provide you the widest choice of self catering accommodation across England. Bellbrook Valley in Devon is available through: Independent.